The irony, am I right? 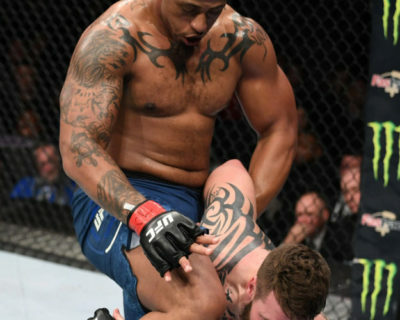 Former NFL pro-bowler, and accused domestic abuser, Greg Hardy (3-1), co-headlined the UFC Brooklyn card against Allen Corwder. And with all of the talk leading up tot the fight, it was only fitting that Hardy would get disqualified. The inexperience of Hardy showed early in the fight when Crowder was able to get the fight to the ground and inflict a good amount of damage. In the second round, Hardy looked to be doing better, but out of nowhere, threw a knee to the head of Crowder while he was still considered a grounded fighter. Following his debut loss in the UFC, the already black sheep of the company, was booed by the crowed as he exited the arena.